General information: Had built in Pizza Hut and Sky TV. Just read the comments and can't believe this place went downhill. 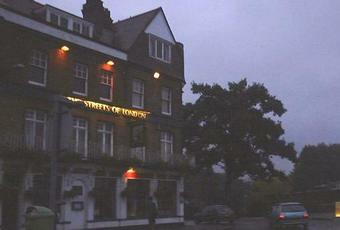 It was a great pub in its time in a beautiful setting, friendly with lots of great regulars in it. Have some great memories of working in there listening to the Gypsy Kings (never thought I would listen to them), the crazy irish manager Mary, and the french deputy Julie who kept everything afloat. Often think of Jamie, you know who you are. Unfortunately had to pack in my fun job, go back to Uni and get a serious one! Have always thought of going back and walking in and getting Jim and Liam a pint, sadly this will never happen now. well was a soul boys hang out, sad to see a pub go. Use to go here as a "kid" when they had saw dust on the floor and live bands upstairs. It use to heave. Good pick-up joint in its time. Even had a wet t-shirt competition on one occasion ! Use to go here after school and order twelve pints during happy hour and sit/run around drinking them all night. The local papers at the time (early eighties) were always complaining about the rough crowd that The Streets attracted and how it was revolting that residents had to wake up and find sick and ripped underwear on their lawns.